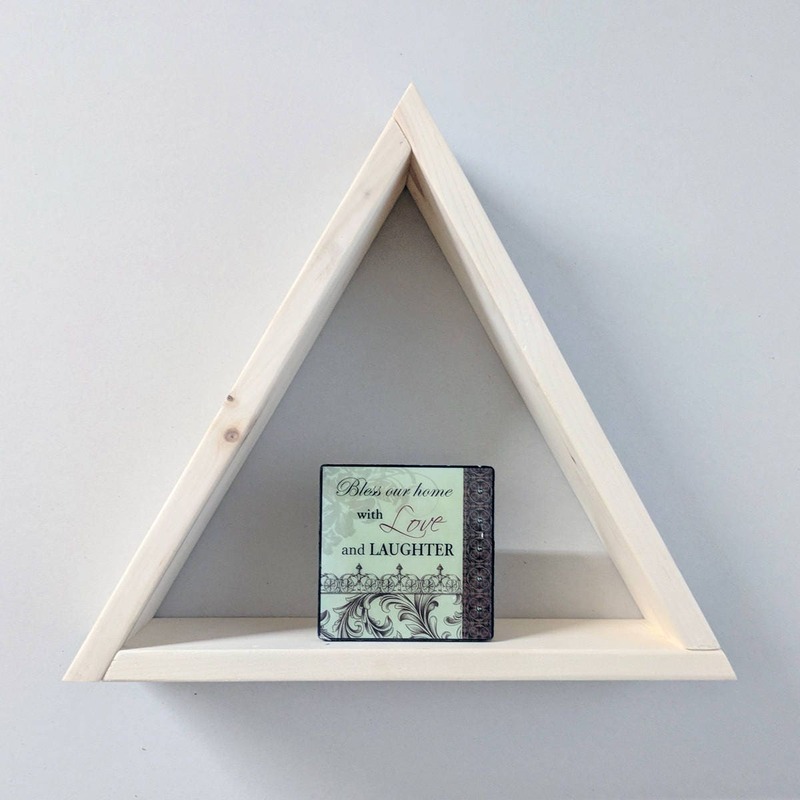 This modern and minimal wood triangle shelf is a great piece of decor for any room in your home. The back features a mounting hole so you can hang it on your wall, or you could choose to let it stand freely on your desk or table. It looks great with small succulent plants, essential oils, healing crystals, trinkets or other items, or even as a piece of geometric art. Hand crafted from new pine and finished in a variety of colour options, including Black Cherry, Walnut, Ebony (Black), Weathered Wood or Natural (Unfinished). This piece is finished in with a satin polyurethane topcoat to protect the wood. The "Natural (Unfinished)" variation does not have a top coat, so you can finish it with your own stain or paint! Dimensions: Approximately 15" long on each side, depth is 3.5"
NOTE: Item in photos is representative of the product, but because all wood is different, yours may have slight differences in wood grains or finish features. ** FREE LOCAL PICKUP AVAILABLE! ** If you'd like to pick an item up at our Orillia, Ontario shop, please send us a message and let us know. We'll send you a code for "FREE SHIPPING" and arrange a time for you to pick up your item. Beautiful shelves, solid wood, well made. Very nicely made tealight holder. I purchased this gift for my daughter in law who loves the more rustic look and she loved it! All of the products we offer are proudly handcrafted in Ontario, Canada. Whenever possible, we use locally-sourced materials or reclaimed materials. If something is not available locally, we may use components from retail shops or hardware stores. Absolutely! Some items we offer are available with custom laser engraving, using either predefined or original artwork or text. Some items may be requested in different stains, finishes or sizes to suit your home decor needs. If you have a request, please contact us!